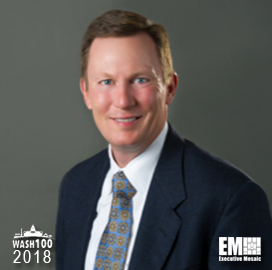 Executive Mosaic is honored to introduce Doug Lane, president and CEO of Capgemini‘s government solutions business, as an inductee into the 2018 edition of the Wash100 — Executive Mosaic’s annual selection of influential leaders in the government contracting arena–for his work on improving customer engagement and providing effective strategies to federal civil agencies. Lane leads the strategic direction of Capgemini Government Solutions and oversees the delivery of products and services to U.S. government clients. He joined the U.S. public sector arm of the French technology, consulting and outsourcing services firm in 2014 after working at management consulting company A.T. Kearney as a lead partner. Under his leadership, CGGS received a $53 million task order in October 2016 to provide independent test and evaluation services at the U.S. Citizenship and Immigration Services‘ Testing Center of Excellence. “Independent testing is a vital step to provide quality services, as it will better enable the agency to meet the pace of customer engagement, ” Lane said in response to the contract award. CGGS completed a lease transaction in September 2016 to relocate its operations in Washington, D.C. and Reston, Virginia to a consolidated headquarters site in Tysons Corner, Virginia. Lane stated at the time that the Capgemini subsidiary employed more than 100 new personnel in the first half of 2016 and the company expects continued growth. He told The Washington Post in an interview that consultants can distinguish themselves by putting clients’ interests above their own and by working in teams. Lane has more than 30 years of information technology and consulting experience, including leadership positions at Booz Allen Hamilton and partner roles at IBM and PwC. Executive Mosaic congratulates Doug Lane and the Capgemini team for their selection to receive this award.